Discussion [Github] Auto-push script help ! [Github] Auto-push script help ! I need to upload automatically an html file to my repository like every hour or so and i'm struggling with a script that I can't seem to make work no matter what I try. You need to commit changes to a file every hour automatically? Or you are adding a new file every hour? Either way, it doesn't sound like you're using git in a reasonable way. I don't want to upload the schedule manually everytime I change something in it so I wanted an auto push script. You are using the wrong tool for the job. most git hooks rely on something like commit. Git doesn't monitor changes automatically, you have to at least stage them. Yes of of course you can run diff constantly, but what is the point? Also what is three commands? A Trello board? A HTML web page? Or... a forum. Not a fan of Trello, found is kind of messy. Basecamp is kind of underwhelming for what you pay. Assana is decent. I've used springloops bambam and it is ok not perfect. Basically any kind of project managemnt software will do or something with a document structure like google docs. If you wan federated maybe apache wave. 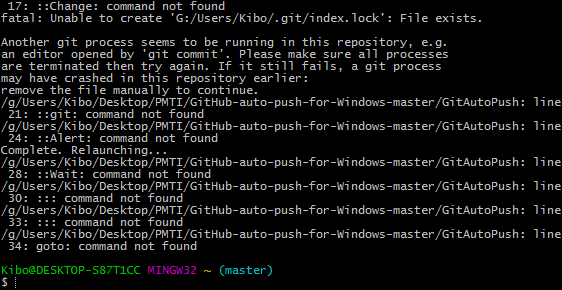 As I understand it, the task is to keep one or more files available for a group of people and the first intention was to use git to host that file. Since a git server does not only host files, but also allows quite sophisticated versioning magic, it is not the best tool, though it could perfectly abused for that reason by using Windows scheduler. But I can't see why there should be any mighty tool involved when it can be achieved by simply using Box, Dropbox, Google Drive or any such service for "hosting" that file? I think they all offer tools which synchronizes a local folder to a remote folder. For an IT beginner, I would consider that the most user friendly solution.